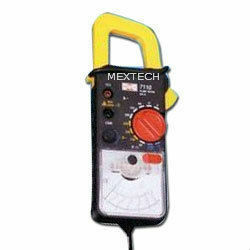 We are engaged in trading of a comprehensive range of analogue clamp meters. These are manufactured in compliance with leading industry standards at the facility of the vendors to ensure these finds application various segments. Our range of meters can be availed at market leading prices by the clients based in various parts of India. We are instrumental in offering our clients quality Analog Clamp Meter DT2103, which are available in varied mm sizes. Our vendors ensure to make use of graded alloys for manufacturing clamps to ensure these have longer service life and are corrosion resistant. Further, all the clamps delivered to the clients are manufactured in compliance with the prevailing industry standards. Universally usable analogue clamp meter in a compact housing. Humidity Range: 15 – 99% R.H.
Our valuable clients can avail corrosion resistant Analog Clamp Meter Mastech M7110. These washers are designed with precision at our vendors' facility to ensure these are compatible with various industry application. The clients can avail feasibly designed clamps at market leading prices. Further, these are packed in safe moisture free packages to ensure these doesn’t corroded.